Pep Guardiola arrived in England in 2016 with an immaculate reputation as a coach, having previously managed Bayern Munich ‘13-‘16, and possibly the best club side in footballing history, Barcelona ‘08-‘12. During his time at these clubs, the 46 year-old amassed 21 trophies, including two Champions Leagues and a league title in six of the seven seasons he’d competed in as a manager. Pep was known for his radical risk-taking, attacking football and revolutionary tactical mind; all of which combined to brand him the world’s most wanted football coach. However, fast-forward to April; his first campaign in England looks set to be the worst of his short managerial career. Conte’s Chelsea look certain to win the Premier League, and Pep’s team exited the Champions League early at the Round of 16 stage; the first time Guardiola has ever been knocked out before reaching the Semi-final. At the business end of the season, Guardiola currently finds his team out of the League Cup and Champions League, fighting for 3rd spot in the Premier League, and awaiting Tottenham Hotspur in the semi-final of the FA Cup; he’d have hoped for better. Obviously, there are many detrimental factors why Guardiola’s team appears to be underperforming compared to his past champions, but the most problematic issue, for me, lies with his current crop of players. Guardiola has managed world-class squads in his career, and for him to thrive, City’s squad has to comprise of players that are capable of implementing his ideas effectively. I’ve taken a look at 4 potential signings that would vastly improve Guardiola’s tactical options, as well as City’s current XI and their style of play. My first recommendation to Manchester City is the German pass-master, Julian Weigl; who would play in arguably Pep’s most important position. Every team Guardiola has managed has had a crucial and highly intelligent player playing as the ‘pivot’ of the team, in between the midfielders and the defence. This player will basically act as Pep’s brain on the pitch, as Luis Enrique was famously quoted as saying this player “is an extension of the coach”. At Barcelona, Guardiola worked with one of the masters of the role, Sergio Busquets, and at Bayern Munich he tested various players in the role including Bastian Schweinsteiger and Thiago Alcantara, before opting to notably change Phillip Lahm’s position and mould him into his conductor. The player playing in the role at Bayern changed depending on the demands of the match and the opponent, but the role was majority filled by Lahm or Xabi Alonso, two exceptionally educated players. At Manchester City, Pep has struggled to identify a player who has really excelled in the role, and has tested Yaya Touré or Fernandinho for most of the season, with both of them performing okay but with flaws. Yaya Touré has the passing range for the role but not the mobility or energy, and Fernandinho is the exact opposite and plays with the energy but lacks that flawless passing ability. 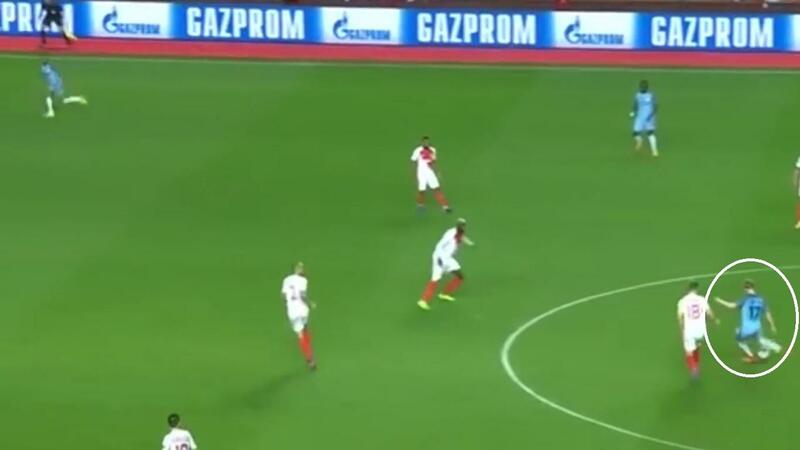 Pep has even tested Kevin De Bruyne in the role, who is pictured dictating play below, and it was successful in the second-half away against AS Monaco, but ultimately De Bruyne is not the solution and is more influential higher up the field. Julian Weigl is the solution that Pep has been trying to find. The 21 year-old German currently plays a very similar brand of football under Thomas Tuchel at Dortmund, and would therefore naturally integrate into the role at City. The role demands passing range, vision, intelligence and mobility, and Weigl has those attributes in abundance. His passing capability is impeccable and it coordinates intricately with his vision, often combining to demonstrate his ability to break with lines and force opponents out of the game with a single pass. This is presented below, as Weigl receives the ball and makes a forward pass that instantly takes 4 opposing players out of the game and allows Dortmund to advance up the pitch into the final third. Weigl has a pass completion rate this season of 90.7%, which is just 1.1% less than arguably the best playmaker in the world and Weigl’s fellow countryman; Toni Kroos. Guardiola requires the player at his pivot to control the play, manage the tempo, switch the play and stop counter-attacks, as well as executing his Juego de Posición concept through brave passing to the options presented by means of the theory. Guardiola understands Weigl’s position exclusively, as it was his position for Barcelona during his playing career, and a role that he learnt a lot about under the mentorship of Johan Cruyff, his footballing father. Interestingly, Dortmund recently moved to sign Mahmoud Dahoud from Borussia Monchengladbach for a bargain fee of around £10m; an exciting player who is very similar to Julian Weigl, with a comparable playing style and passing ability. The conspiracy theorists may suggest that this transfer represents a concealed acceptance from Dortmund that they won’t be able to keep Weigl for much longer, and that Dahoud is his replacement rather than his midfield partner going into next season. Possibly, Borussia Dortmund are preparing themselves for a big-money summer bid from Manchester City for their midfield conductor, and if so, Pep will have found his deep-lying playmaker. Ederson Santana de Moraes, otherwise known as Ederson, is a proactive goalkeeper that would solve Pep’s everlasting problem between the sticks. Man City have struggled with their goalkeeping situation this season, with Joe Hart being controversially loaned to Italy, and his replacement Claudio Bravo proving to be an eccentric disaster on countless occasions. Hart’s form in Italy has been poor, and he’s made more defensive errors than anyone in Europe’s top five leagues, signalling that he’ll most likely be sold in the summer. With Bravo also likely to be moved on, Ederson should be a prime target for Guardiola. The 23 year-old Brazilian currently ply’s his trade in Portugal’s Liga NOS for SL Benfica, and has contributed to his side keeping 14 clean sheets in 21 league games, that’s an impressive defensive shutout in 67% of the matches he’s played. His goalkeeping basics are as strong as you’d expect from any top quality keeper, as he looks to command his area and has impeccable shot-stopping quality. These shot-stopping reflexes were demonstrated in abundance against Borussia Dortmund in the Champions League this season, as he almost single-handily won the tie by making repeated saves, denying Pierre-Emerick Aubameyang from the spot, and keeping a clean sheet to win the match 1-0. However, the most significant trait of Ederson is his goalkeeping style, as he acts as a dynamic sweeper-keeper by dominating one-on-ones and rushing from his line to intercept through balls at the first opportunity. 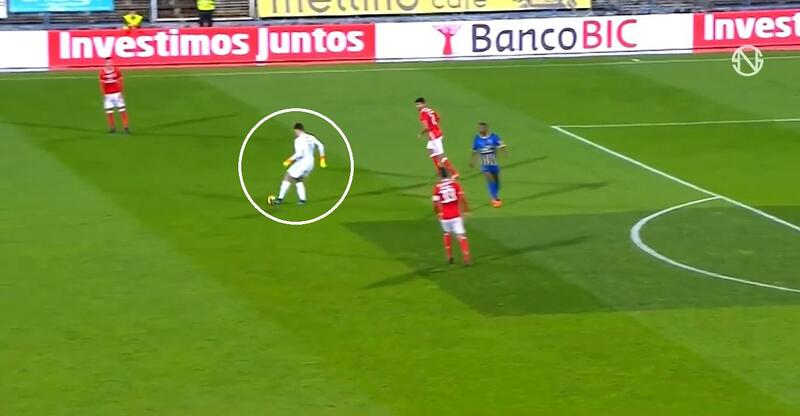 This is demonstrated above and below, as in both scenarios Ederson ran swiftly away from his position to intercept a through ball, and had the composure to carry the ball, look up and make a simple pass rather than hitting long. This is vital for a Pep Guardiola goalkeeper, as his teams play with such a high-line to play in the opponent’s half, so this naturally leaves a lot of space for the opposition to exploit in-behind. Ederson is brave when sweeping up and will impose his 6’2 frame on any attacker looking to take advantage of the space in-between his position and his defence. Fabinho is a tremendously versatile right-back who has played most of the 16/17 season as a central midfielder for AS Monaco. His position this campaign is largely due to the way Leonardo Jardim wants his side to play, as well as the quality of the options Monaco have in the full-back areas. Pep Guardiola often requires his full-backs to play as inverted wing-backs and slot into the central areas of the pitch when his team are in possession, as pictured below. This season, Pep has relied on Bacary Sagna and Pablo Zabaleta to execute the right-sided inverted wing-back role; however they are limited in their level of performance. This is largely due to their age, as Sagna, 34, and Zabaleta, 32, are both well past their peak and have performed as regular full-backs for their whole career, so learning a totally new position can prove problematic. Fabinho however, is highly comfortable playing in central areas as well as on the periphery as a right-sided full-back, and would therefore be ideally suited to Guardiola’s tactical innovations. Similar to Ederson, Fabinho is also a 23-year old Brazilian, and is a highly capable and clever player considering his young age. One of the key attributes you assume for a quality full-back is pace, but for Pep Guardiola, intelligence is much more valuable for a player in this position, as he requires exceptional positional sense and tactical awareness from his full-backs. Fabinho fits that profile well, as although he isn’t the quickest when carrying his 6’1 frame around the pitch, he’s very rarely caught out of position and is a highly reliable player. Fabinho has contributed 9 goals and 4 assists this season, mostly from central midfield, and is also Monaco’s penalty taker with an impeccable record of 15/15 for the club. He’s pictured below slotting a penalty away from home in Ligue 1 using the famous Panenka technique. Confidence. Such attacking stats demonstrate that Fabinho can offer so much more than Sagna and Zabaleta currently contribute, by acting as a more complete footballer and influencing all phases of play rather than solely the defensive aspects. As demonstrated below, Fabinho’s player radar is almost identical to Fernandinho’s, with very similar passing success rate, and both being equally effective at winning the ball. These similar radars signal that Pep would be signing a full-back who is just as capable as one of his best midfielders; allowing Pep the option of being able to occasionally use Fabinho as Fernandinho’s replacement whenever he is unavailable. Fabinho wouldn’t be cheap, but City can afford him and if you’re going to employ arguably the best manager in the world, you want to give him the essential tools to implement his plan. Álex Grimaldo is the second full-back recommended to Manchester City, however this time it’s for the left-sided position. Grimaldo is a La Masia graduate, but struggled to break into the Barcelona first-team due to the consistency of Jordi Alba amongst other reasons. He’s ideally suited to Pep’s methods and has the desired profile of an attack-minded full-back who’s young enough to progress. In January 2016, Álex Grimaldo spread his wings from captaining the Barcelona B side and moved to SL Benfica for an absolute bargain fee of £1.79m. Playing alongside one of my previous recommendations, Ederson; Grimaldo has come of age as a footballer and has developed significantly in the short period of time he’s played for the Portuguese club. After captaining Barcelona’s B team and making the brave move to leave the Spanish giants at such a young age, the tenacious full-back clearly demonstrates a resolute mentality. This will be tested by Pep; a coach who is known for drilling his defenders in training, as Javi Martinez effectively had to learn how to walk again when Pep arrived in Bavaria and opted for a change in his position. An advantage for Grimaldo, is that he learnt the beautiful game at perhaps the most established academy school in world football, La Masia. Prospects that are developed at Barcelona’s reputable academy are often very intelligent and highly technical players who are comfortable on the ball regardless of their position. Grimaldo’s comprehensive footballing growth at the club that Guardiola learnt his trade at effectively means that the player is tailor-made for Pep’s philosophy and any positional versatility will come natural to the 21 year-old Spaniard. Grimaldo will ofter plenty more going forward than Clichy and Kolarov, as he’s faster and more energetic than both, as well as having further value in his ability to take excellent set-pieces. Kevin De Bruyne currently takes the majority of set-pieces for City, but Grimaldo will offer a left-footed option that is currently lacking with the exception of David Silva, who isn’t a set-piece specialist. Álex Grimaldo appears to be an ideal full-back for Pep Guardiola and his style of play, as the youngster has been programmed to think in those ways due to his upbringing at La Masia. With age still on his side, Grimaldo has more than enough time to be moulded by Pep in a manner similar to that of Juan Bernat at Bayern Munich. Available at a relatively cheap price in comparison to other options in Europe, this one is a no-brainer. To conclude, it is clear that Manchester City need to further reinforce their squad this summer in order for Pep Guardiola to further implement his Juego de Posición philosophy. Due to his style of play being so idealistic, Pep has to have particular footballers at his disposal; the more suitable these players are to what he desires, the better the philosophy will be fulfilled. When reviewing the recommendations suggested, they signal that Pep’s current squad needs a major reform in defensive areas, as I have prioritised a new goalkeeper, two full-backs and a defensive midfielder for the coming summer. Ideally, Pep will have all of these players at his disposal for the 17/18 campaign, and if so, his chances of lifting the Premier League trophy will be vastly improved.